Here's a dessert that you'll love. It's a concentrated almond delicacy that caters to the taste of Middle-Easterners and Pakistani sweet tooths alike. Almond is derived from a small tree of the rose family. It's the kernel of the tree's fruit, encased within a hard shell. Almond is a wholesome food. It's an excellent source of vitamin E and magnesium, and a good source of soluble fiber. It also offers heart-healthy mono-unsaturated fat, protein, potassium, calcium, phosphorous and iron. One ounce or about a handful of almonds would contain approximately 160 calories. Eating a small quantity of almond daily can lower the bad cholesterol (or LDL). Eating almonds may also help to maintain or even lose weight if combined with a low-calorie diet, because it prevents people from overeating other foods. Though the recipes of almond halwa contain no saturates and no table or whipped cream, it's still a somewhat rich dessert. Mix the ground almond and whole milk into a paste. Heat the water in a saucepan and melt the sugar in it. Let this sugar syrup come to a rolling boil. Add the kewra, yellow color and saffron. Boil for another couple of minutes. Then add almond + milk paste to this syrup and stir well to prevent any lumps. Add the cardamom powder or whole cardamoms. Keep stirring the mixture so that it does not stick to the bottom of the pan. As you keep stirring, add the oil gradually. Oil will get absorbed almost immediately. By now the mixture will look somewhat translucent and shiny, resembling the consistency of whipped jam or very thick pancake batter or custard. You will observe that the task of stirring will also become a harder because of its thick texture. Remove from the cooker and let it cool for 30 minutes. It solidifies quite fast because of the sugar syrup. Then put it in the fridge for about 2 to 3 hours. After about 3 hours, take it out from the fridge. Check if it feels rather hard, sticky and quite solid. It should by this time. Now put on your disposable kitchen gloves and using your fingers, take bite size or larger chunks of the halwa and shape into flattened rounds or squares, as desired. Place them side-by-side on a flat plate or tray. Garnish with sliced almonds and green pistachios. Left over can be stored in the fridge for days. Just make sure that if you store it in the fridge, the rounds or squares must be placed on the plate / tray beside each other. They shouldn't overlap as they have a tendency of sticking together in the refrigerator. You will need 2 saucepans. In one saucepan, heat the oil and fry the ground almond and cardamoms. The oil will quickly get absorbed with the ground almond, but do not add extra oil. Go on stirring (or roasting) even if it looks a bit dry. Remember, almond itself contains plenty of oil, so it won't turn dry enough to stick to the pan. Keep stirring on medium heat for 7 to 8 minutes till almond looks pale brown like bread crumbs. It will give out a subtle and appetizing aroma of cooked almond. Remove from heat. Cool for a minute. Then pour the thick milk onto the almond. Put it back on medium heat and stir for another 2 to 3 minutes till the milk gets a little absorbed. Remove from fire and keep aside for a while. In the meantime, prepare the syrup in the second saucepan in exactly the same way as in method (1). Remove the syrup from the cooker and mix the prepared almond + milk paste with this syrup. Put the mixture back on the cooker and stir for about 5 minutes till it gets a little thicker, but still somewhat fluid. Remove from the cooker and pour into a deep serving dish. Allow it to cool for a while. Then put it in the fridge for an hour. Garnish with slivered almonds and green pistachios. 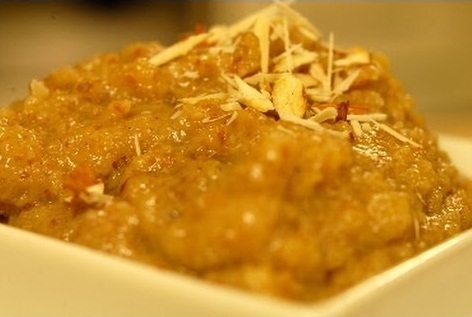 This soft halwa will not set enough to be shaped into rounds or squares. It will be about the same consistency as souffle or mousse. Thus, while serving you'll need a spoon. You can make the halwa of any consistency you desire with either of the two recipes. For a hard halwa, you simply need to stir the syrup + almond mixture for a longer time. If good quality ground almond is not available at the stores, you will need one cup whole almonds. Boil this with 2 cups of water for one hour. Remove the skin. Grind in the blender with about 2 tbsp or little more of milk / water. Yeah, I know this will mean more work! In this case, you can prepare the ground almond a day in advance, and make the rest of the halwa the following day. While handling recipes with lengthy procedures, it's a lot wiser to divide the work, spreading it over 2 or 3 days instead of doing everything in a single day. That drives me crazy! However, those living in North America will find plenty of great quality ground almond in the bulk barn stores. After all, many people in the West use ground almond mostly for preparing desserts with marzipan. Well .. that's all about this simple yet unique almond halwa dessert Enjoy! My aunt and I shared this info this morning. She said she'll try out recipe 1 and I'll try out recipe 2 and then decide which is better. I can sense that you're right. recipe 2 sounds more attractive to my taste buds. roasted or cooked almonds are my delight! will let you know after we've made this ..
Really? I didn't know Bulk Barn was selling unblanched almond flour these days. In this case, yes, as you cook and boil the almond flour, the dessert will start to turn brown as the color of the skin dissolves out. But if the taste comes fine, and it should, then it's okay. I'll tell you what, you may find blanched almond flour (same as blanched ground almond) at Walmart. However, even if you use the unblanched one, try to cook the almond to the minimal and then when you put it in the syrup, don't use yellow coloring. In that case it's likely the brown color of the halwa will be paler. As long as it tastes the same and the kiddos like it, don't worry about the color. I will InshAllah visit Bulk Barn and buy a little almond flour one of these days, try it out and then let you know. I'll also check if they are selling both blanched and unblanched or just unblanched. Salam again sis. Fortunately some bit of that unblanched almond flour was leftover in my kitchen cupboard. So I experimented it with your guidelines and made a small quantity of almond halwa this evening. Yeah, the color was just a big paler, a shade or two, but still quite dark. Moreover, because I cooked the almond flour to the minimal to minimize the release of color and to prevent the almond skin getting darker, the halwa didn't taste as good as the darker one I made a couple of days earlier. I was somewhat expecting that as it's essential to cook the almond flour for a sufficiently long time until it gives off enough cooked-almond fragrance. Plenty of thanks for this experiment dear sis. It saves me that work. I understand under-cooking the almond will have an affect on the halwa. You're absolutely right about that. And with the color of the halwa being just a wee bit unnoticeably lighter, it's apparently not worth it. The bottom line is, blanched almond flour or blanched ground almond is pretty much a necessity for this particular dessert. I suppose I should highlight this point in the posted recipe so shoppers of ground almond who intend to prepare almond halwa can look for the right stuff - blanched ground almond. You're welcome Sis. Yeah you did well putting up that appendix. I was told that blanched whole almond flour from Walmart's Gerrard Square Supercentre called 'Bob's Red Mill Almond Meal Flour' is available for online purchase. That's okay but I've also heard that this product is often out of stock. Approximately 450gm for $17 or 18. Price seems okay. For those comfortable with online shopping, can find this item in various places including Amazon. Also, I will check with Bulk Barn if they are storing both kinds of almond flour, blanched and unblanched. That's possible. I'll also check with the branch close to my place. But I'm pretty sure they had just the unblanched one which for us is pretty useless stuff. Hey sis! check again. Blanched almond flour is available in Bulk Barn. It's there in the branch close to our place. They have both. The one with skin is labeled 'natural almond flour' and the other is 'blanched almond flour.' Bins are side by side. This will be cheaper than Bob's Red-Mill Almond Flour which is approx.450 gm and $17. In Bulk Barn if you buy same quantity it will be approximately $10 or so. I'm not saying Bulk Barn is a low cost store ... by no means! But they gotta keep a margin for unpacked products otherwise no one will buy from them. Thanks for this info Sis Heba. Good news for Sister Ruhi and me. I think Sister Ruhi, you didn't find it on that particular day. They may have run out of stock. Thanko sis Will InshAllah definitely check thoroughly when I go there next time. Didn't know the price difference was that much between the two brands of this product.